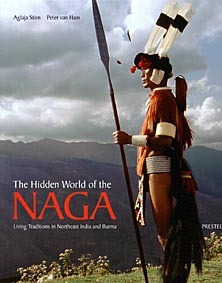 ”The Hidden World of the NAGA” is a remote region in Northeast India, which stretches from Nagaland over parts of the Indian states Manipur, Assam and Arunachal Pradesh to the Sagaing district of Upper Myanmar. It has been secluded for the last 65 years, and thus has become ”the Last Great Mystery of Asia”. Its steep gorges and elevated hilltops are inhabited by thirty ethnic groups comprehensively called ”The Naga”. Over the centuries these proud peoples, that were notorious for their headhunting activities in the past, have developed extraordinary and highly unique cultural traits. For the first time ever ”The Hidden World of the NAGA” documents their religious customs and beliefs, their festivals as well as their art: weaving, woodcarving, dances and traditional architecture. The great number of art works shown in this magnificent book come from the renowned collections of the National Museum, New Delhi, the State Museum of Nagaland, the Museum der Kulturen, Basel and the Voelkerkundemuseum der Universitaet, Zurich as well as from private collectors, all of which have never been published before. The unique musical traditions of the Naga, never heard before in the Western world, can be heard on a CD, which is about to be published by the Smithsonian Institution. 192 pages with 294 colour- and 39 black and white illustrations and 2 maps. Prestel Publishing Munich, Berlin, London, New York. Original price: 75 Euro, 85 USD, 55 GBP. "NAGA - Kopfjaeger im Schatten des Himalaya"